The ProForm Smart Strider 935 CSE is a great elliptical from ProForm’s front drive series and it delivers a great amount of features for a mid-range trainer. One of the top features of the ProForm Smart Strider 935 is the 7” full color, web-enabled display which can be used to track your workout showing time, calories and distance. But best of all is the capability to connect it with IFIT® to enable you to use Google Maps™ and run anywhere in the world. Use the screen to trek through some of the greatest mountain ranges in the world or run along any white sand beach you desire. Polar® also produces a wireless chest strap that comes with this model to allow you to monitor your heart rate without having to grip the sensors, and with a huge amount of programs to choose from your workout can push you as hard as you want it to. UPDATE: The 935 is no longer available. It has been replaced by the new Smart Strider 895 CSE, an upgraded model with better features. The ProForm Smart Strider 935 reviewers are very happy with the overall design and productivity of this type of elliptical and it definitely stands out above ProForm®’s other lower spec models. 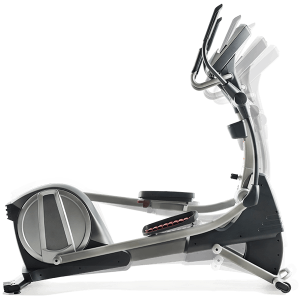 This trainer is packed full of functions such as the incline adjustments and in hand quick controls to give the rider an effortless experience where the trainer does the work for you. The ability to connect your IPOD® to listen to your own tunes without headphones is a great plus but is becoming more of a standard install on exercise machines. The SpaceSaver® design always gives the reviews a positive tilt because it is such a functional addition that makes it great for all users. 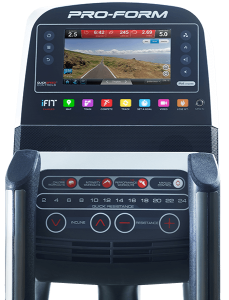 The iFit technology built into the machine is a big plus here, as it is not built into the mid-range 735 model and completely absent on the entry level 535 Smart Strider. The 935 also has the wireless heart rate monitor, 30 workouts, and internet capability, so it is definitely the best choice of the three as far as features and capabilities are concerned. For a mid-range trainer the ProForm Smart Strider 935 ticks all the boxes. A great amount of functions, applications and range of resistance teamed up with nice additions such as a full touchscreen color display making this trainer feel a lot more high class than the price tag attached to it. We particularly like the SpaceSaver® design because it allows the user to “pack away” if not in use. Also, iFit built in opens up a whole world of possibilities and keeps you motivated to use the machine every day.